So today I went into my local Superdrug to see if there were any beauty deals on, and Barry M were having a “Spend £6 or over and get a free limited edition polish” deal. Barry M being my favourite drugstore brand I HAD to pick up on this deal and get even more nail polishes to add to my slightly obsessive collection. The first polish I picked up was “Mocha” (Center) from their matte collection. I had my eye on this colour for a couple of weeks since I don’t think I’ve ever used a brown polish before, and it looked like a different and stylish shade to try. Mocha is a creamy, medium brown shade, much like the drink, and is almost milk chocolately aswell. It looks like a great colour to use if you;re a bit of a grunger like me, and like to express your “darker” side as you will. I also think this colour would look great if you have medium to long length nails. The second polish I picked up was “Damson” (Left) from their gelly collection. Damson is like a light royal blue, and being from the gelly collection it promises high shine. I have one or two blues from Barry M including Aqua Glitter, but that’s about it. I’m not a massive fan of blue nail colour but my friend Kirsti has an ombre blue effect on her nails and I wanted to do the same. I quite like pastel blues for the summer but Damson looks really chic and would look good on long length nails like mine. After I picked these two, I was entitled to a free limited edition polish, so I picked “Seaside” (Right), a sparkle turquoise colour. Again, not a massive fan of blues but I think Seaside will look great used in an ombre effect with Damson maybe. Seaside also comes out a little sheer, so it would benefit from a couple of coats. I don’t think I would use this polish on its own, but the other limited edition colour was a bright sparkle hot pink, something that I’m not a fan of! 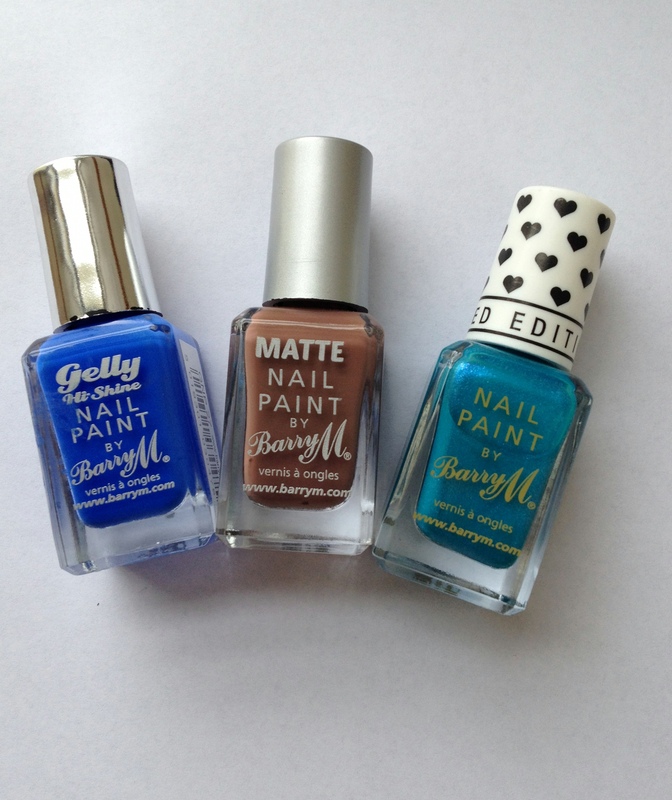 I’m really happy with my little Barry M haul, especially Mocha, and I can’t wait to get using them and experimenting! Damson is perfect! I love the colour! Great post .